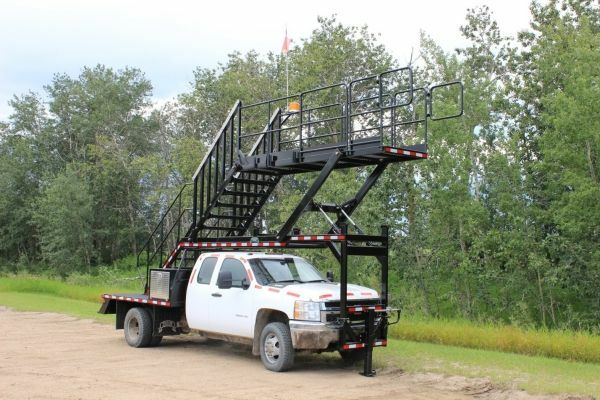 CUSTOM STAIRCASE TRUCK - Wabash Mfg. Inc. The new Infinitely Adjustable Wabash Staircase Truck can be used by a variety of personnel to access difficult to reach locations such as shovel dippers and track components with ease. The Truck is driven forward towards the machine and the platform is positioned. Then the jack at the front of the truck is lower for added stability and safety. Once the unit is in positon, personnel can then easily ascend the staircase with a variety of tools and maintenance equipment. The top platform features removable side railing sections. This allows even greater flexibility as the user is able to remove and stow the railing portions if they desire to work from the side of the platform. The stairs and top platform feature Perf-O Grip safety grip grating. The round holes ensure easy removal of debris and superior personnel foot traction in the most extreme weather conditions. The integrated electric over hydraulic system powers the hydraulic rams which elevate and lower the platform with precise control. hollow structural steel sections are used to manufacture the majority of the unit to increase strength and durability.